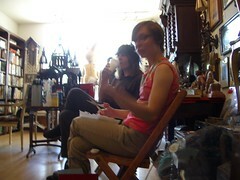 Here are some photos from the Indie=pendence Day sale in Decatur. We had a really great time meeting everyone and seeing all the amazing handmade goodies. 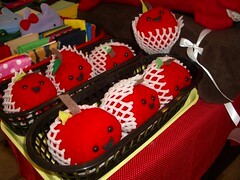 Here are some of my Happy Apples at the table. 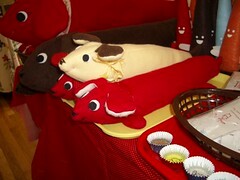 Here are some of the other things we have made! 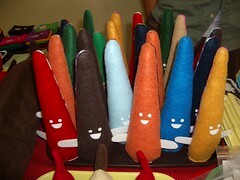 Raoul sewed an army of fangs! Check them out! Here I am sporting my new sleep mask from the amazing artists at Deli-Made. I also got two beautiful prints from Alena, one of a bunny, and the other of a fawn. The other goodie I came home with was a top from Snowflake 66 that is now my new favorite top! 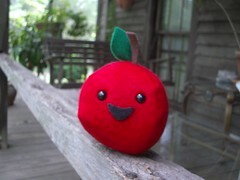 Raoul and I will be participating in the Summer Indie-pendence Day Sale on Sunday, July 9 from 12-5pm. 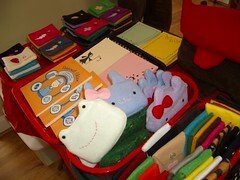 We will have so many cute handmade goodies for sale, please come and visit our table! 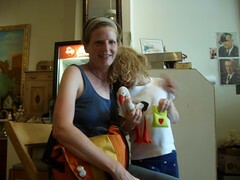 The Church of Craft Athens welcomes Elizabeth and her daughter, Clare, who joined us at the last get together. Elizabeth made the sweetest little bunny toy that was inspired by a vintage bunny she bought at an antique shop in Savannah, while Clare beaded. It was alot of fun crafting, talking to Paul, and meeting new people. I cut out lots of little pink and blue birds while Raoul sewed some new plushie ideas. Dave had his embossing kit and went to town.